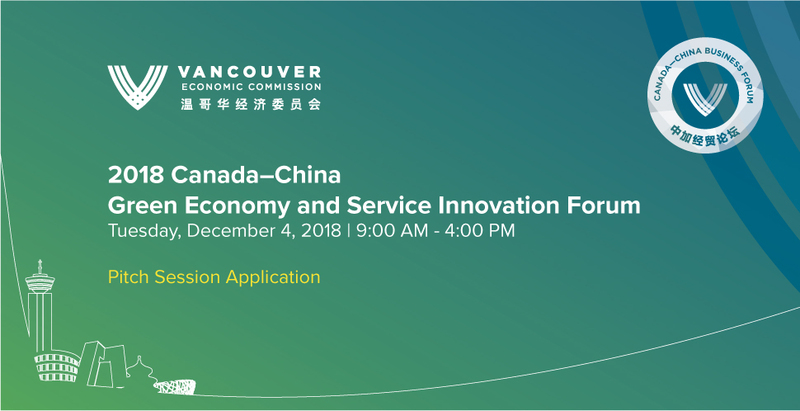 The 2018 Canada–China Green Economy and Service Innovation Forum will feature and celebrate business leaders in the green economy and professional services sectors. We invite businesses with an alignment to the green economy, professional services and the Asia Pacific to apply to the pitch session that will take place during the forum. Your audience will comprise of key representatives of local and international governments, enterprises, investors, research institutions, law firms and financial institutions. Pitches will be 5 minutes long. Businesses and professional services that provide green economy products and services are invited to apply to pitch. Green economy products and services include innovative agritech, clean energy, electric vehicle, green buildings and transportation, waste management or smart city solutions and other services that promote sustainable economic development. Examples of applicable professional services could be financial, legal, environmental impact and marketing consulting related to the green economy and/or doing business in the Asia Pacific. Space is limited so interested companies should apply as soon as possible. Applicants will be notified if selected.